One of the major things that Bitcoin is known for in the press is the number of Bitcoin scandals that this young cryptocurrency has seen over the years. While the Bitcoin has improved its security over the years to help ensure that many people’s currencies stay secure and to stop huge hacks on digital exchanges to protect money, there have been a number of high profile arrests and scandals that have dominated the news. Instead of shying away from this part of Bitcoin’s interesting history, we’ve decided to grab it with full force to show you where things went wrong for the cryptocurrency, yet how it still manage to defy the odds and is now beginning to dominate a number of online markets. 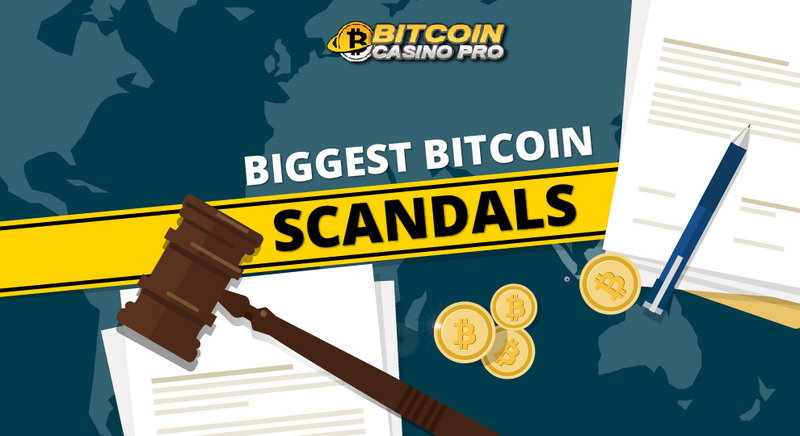 So, without further ado, here are some of the biggest Bitcoin scandals throughout history! With the cryptocurrency remaining being in its infancy in 2014, it was highly likely to see a number of issues pop up throughout the year. However, nobody expected such a huge blow to hit the digital cryptocurrency as the collapse of the largest digital exchange at the time Mt. Gox. The exchange began to freeze accounts and halt operations slowly, and at the beginning of 2014, the exchange market went out with a bang, announcing bankruptcy and ultimately collapsing. This was a huge hit for Bitcoin, and some believe that the impact of Mt. Gox. can still be felt today. But 2014 didn’t stop there for the Bitcoin in terms of scandals, and within the same year, founder of Silk Road (the black-market trading place known for its dealings in Bitcoin) was found guilty of conspiracies to commit money laundering, computer hacking and also drug trafficking. On top of this, we saw the high-profile arrest of Charlie Shrem on federal money laundering charges, the disappearance of Bitcoin Start-up Neo & Bee’s CEO who is still MIA to this day after the company suddenly went under, and also the Chinese Government attempting to censor all media coverage of Bitcoin, putting in a number of media regulations regarding all form of media related to the cryptocurrency. 2015 was somewhat more of a quieter year for the Bitcoin in terms of scandals, but there was one that really did rock Bitcoin’s world. $72 million was stolen from Bitfinex exchange, in Hong Kong which resulted in it being the second biggest security breach of all time. The Bitcoins ended up being stolen from segregated user wallets, and this even resulted in a slump in the value of the Bitcoin by over 23%. 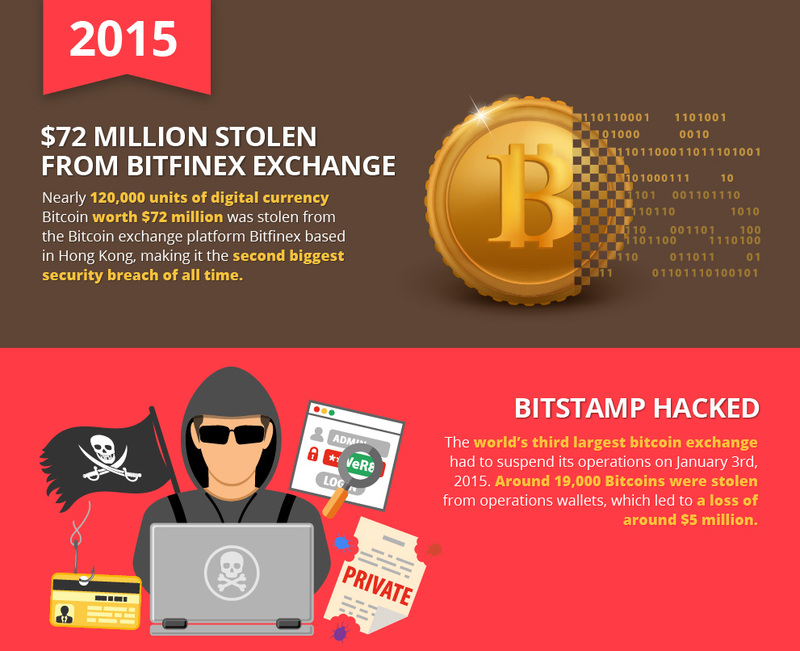 This wasn’t the only hack that happened in 2015, as the world’s third largest Bitcoin exchange ended up being hacked, with around 19,000 Bitcoins being stolen from operations wallets, which ultimately led to a loss of approximately $5 million. However, these two huge events in 2015 led to a number of security changes, as 2016 saw a much quieter year of scandals, which was focussed on the cleaning up of the Bitcoin world as opposed to large-scale hacks and money losses. As mentioned above, we didn’t see any large-scale hacks or breaches in the Bitcoin world throughout 2016, instead seeing a number of individuals take the limelight. One of the biggest media draws was the imprisonment of an ex-US Secret Service Agent who was sentenced to 5 years and 11 months. This particular Secret Service Agent was actually investigating Silk Road and was part of the operation that helped to take the infamous black-market drug trade site down. While he was part of this however, the agent actually ended up stealing a whopping $820,000 in Bitcoin from the site, and in order to ensure that blame didn’t land on him, he was busy setting up a co-operating witness to take the blame! 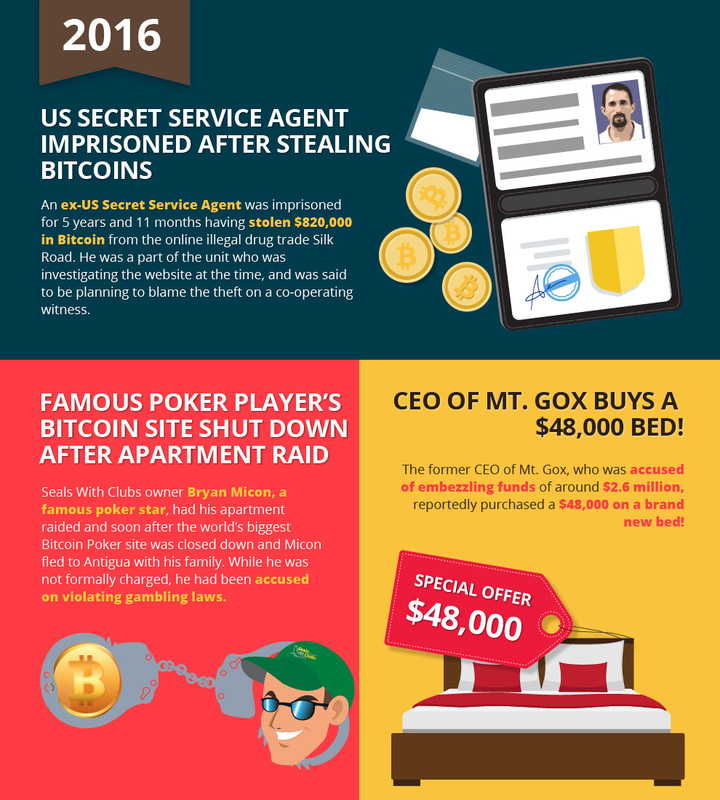 In addition to this, we saw the apartment of famous poker player Bryan Micon being raided at gun point by police, in connection to violating gambling laws, after his popular Bitcoin poker site Seals With Clubs was shut down. While he was never officially charged with anything, mainly due to the fact him and his family fled to Antigua after the raid, he was supposedly handed a warrant that depicted charges against him after a violation of the Nevada Gambling Laws related to online gambling. In addition to this, the former CEO of Mt. Gox, was accused of embezzling up to $2.6 million of funds. But this isn’t the most interesting part. In fact, while the CEO supposedly embezzled the majority of the funds in software, reports suggest that he actually embezzled $48,000 in a brand-new bed! While all of these scandals really hit the headlines throughout the evolution of the Bitcoin, there’s a huge number of improvements that have been put in place in order to help improve the security behind the Bitcoin and the blockchain technology. A new system was actually created early in 2017, which used Bitcoin’s security machinery to help defend people against online identity theft. This shows just how trusted the security behind Bitcoin is becoming. However, a rival cryptocurrency, Etherereum was actually announced as the most secure public blockchain, so we’re highly likely to see a huge number of improvements made to the Bitcoin in the near future in order to steal this title back from its competitor. Within the Bitcoin and blockchain technology, there are a number of security algorithms that have been put in place in order to help improve the security of the Bitcoin, so we see this as a truly secure currency system that is trusted by countries around the world very shortly. With online Bitcoin casinos providing a whole new world of gambling online, with increased security options, it’s likely that we will see a number of other industries begin to adopt this technology, without the fear of a scandal.